There are several articles in the web explaining what Baffle Diffraction Step is and how it is integrated in loudspeaker SPL responses. Our approach will be kept as simple as possible and at the same be directed to all those practical implications that affect speaker design procedures. -What is diffraction in sound waves ? In general diffraction is a phenomenon associated with a wave propagating not in a straight line. If diffraction did not exist sound waves would not propagate behind obstacles. A completely silent shadow zone would be formed behind objects in the same way it is formed for visible light within an ordinary house. An almost closed door leaving only a small slit would let the sound waves enter the room in a "straight line" sense, "illuminating" only a small portion of its volume. We say that a sound wave 'diffracts' around the edges of an object and by that we mean that it bents around the object's boundaries and propagates in the 'shadow' zone even with a substantially attenuated pressure level. The energy of diffracted waves is strongly frequency dependent. Low frequencies bent around objects without much attenuation. On the other hand only a small part of the energy (and pressure level) of high frequency sounds enters the shadow zone of obstacles. Generally speaking high frequency sounds diffract weakly. -So what exactly is 'baffle diffraction step' and how is it associated with sound diffraction effect ? A straightforward answer can not be attempted before one understands how diffraction works for sound waves propagating away from a loudspeaker driver flushed on an ordinary speaker front baffle. Loudspeaker drivers emit sound waves in a spherical sense to a good degree of accuracy. Imagine a non vibrating loudspeaker diaphragm that moves suddenly for a very short period of time. A sound disturbance is created that looks like a spherical wavefront propagating away from the loudspeaker center. This wavefront looks like a semisphere of increasing radius having its geometrical center at the center of the loudspeaker's diaphragm. As time elapses the growing semisphere reaches the baffle perimeter. What is interesting is that as time evolves wavefront radius grows enough to reach one (the closest) or two cabinet edges at the same time. When this happens diffraction is introduced. In this figure the loudspeaker is placed in the middle of the baffle's width. In this way wavefronts reach the left and the right edge at the same time instant. As a result diffraction takes place at both edges simultaneously. Points across the line of the cabinet edge now act as new sound sources the wavefronts of which are shown in red color in the figure on the right hand side. Diffracted wavefront propagates towards all directions : one part of it "illuminates" the shadow zone and the rest of it travels in front of the speaker's baffle. Primary (in blue color) and diffracted wavefronts intersect across an arc and join each other. It is obvious that for a freely suspended speaker (ie. not touching the floor) diffraction takes places at all four edges of its front baffle. For a speaker resting on a floor only three edges will create diffracted sound waves. Among other results diffracted waves actually extend the propagation of "direct" waves in the shadow zones, i.e. in the areas of space which are next to the front baffle. They also propagate in front of a speaker's baffle behaving as new sound sources with their origin on each edge, as this figure depicts. Now imagine a listening point in front of a speaker (usually somewhere close to tweeter axis). Let us use sound "rays" instead of abstract waves to see what happens around a typical speaker enclosure. As we can observe in the figure on the left hand side, a loudspeaker emits a sound ray in the front direction (long blue arrow). At the same time it emits several other rays that propagate in parallel to baffle's surface, at 90 degrees off-axis (four of them are drawn in blue). These off-axis rays reach all four baffle edges and diffract. For each edge a diffracted ray in red travels in space and arrives at our listening point. At the same time diffracted waves propagate alongside the speaker's side walls and reach the edges at the back where new diffraction occurs. Finally the space behind the speaker is illuminated by newly born diffracted waves or rays (not shown). -What is so important in the fact that diffracted sound waves propagate sideways and behind a speaker's enclosure ? What is the meaning of diffraction "step" anyway ? We can easily understand that listening points in front of a speaker receive direct sound field and attenuated diffracted field with some delay. Wave addition of these sound fields is complex and produces interference: some frequencies are amplified (total SPL exhibits local peaks) and some other cancel out (total SPL features local dips). Space behind a speaker's cabinet is mostly illuminated with lower frequencies. Points in front of the speaker's baffle exhibit a destructive wave addition of direct and diffracted fields that attenuates sound energy and therefore SPL at low frequencies. All loudspeaker drivers are measured on a very large baffle board (with weak diffraction effects) so that their properties and SPL responses are recorded and presented by the manufacturer without any dependence on final speaker geometry and the "end-user environment". Loudspeakers on such a "baffle" radiate in what we call "half space" ( a semisphere in front of the baffle). At such circumstances loudspeaker passbands exhibit almost flat SPL responses (usually around 87-90 dB) with fluctuations mainly due to cone breakup etc. When such a driver is mounted on a real world speaker cabinet, its very low frequency radiation is subjected to "full-space" propagation ( a sphere embracing speaker cabinet) while its very high frequencies are spread to "half-space" only. Diffraction sends very low frequencies also to the space at the back and leaves very high frequencies unaffected in the front. As a result when we examine ordinary speakers at a listening point in front of their baffle, we find that a loudspeaker's SPL at very low frequencies has dropped down by as much as 50% compared to manufacturer datasheets (-6dB drop) while very high frequencies keep their original intensity level (0 db change). All frequencies in between exhibit interference with peaks and dips. This drop is what was named "Baffle Diffraction Step" or "BDS". Back in 1951 Harry Olson isolated the "BDS" response for a rectangular-baffled speaker having a driver placed somewhere near the top edge in the figure on the right. In his paper similar responses were printed for various speaker enclosure shapes. Sphere as a solid shape was distinguished for its smooth BDS response. A careful study of the above BDS response plot verifies the existence of the 6db step between very high and very low frequencies. This response is to be combined with the SPL response of a loudspeaker driver measured by its manufacturer on a very large baffle. This holds either for tweeters or woofers. BDS only adds response anomalies (peaks and dips) to tweeters well above 200Hz since these drivers do not emit very low frequency either on-axis or off-axis. Tweeters do not illuminate cabinet edges with very low frequencies. In the case of woofers BDS attenuates their bass response and adds anomalies in the mid-frequency range. Let's have an example. A two-way standing-floor speaker system (picture on the left) was used for simulation of the BDS response with the 'Edge' software by Tolvan (copyrighted material). Simulation was applied on tweeter driver by simply entering geometrical data of baffle dimensions and driver's placement. 'Edge' software is very straightforward in its use and is therefore strongly recommended. We can all gain experience through its repetitive use on speaker design case-studies. Another very practical BDS simulation program is the 'Baffle Diffraction And Boundary Simulator' by Jeff Bagby (also copyrighted material). LinearX Systems Inc., creator of famous 'Leap5', also offer 'EnclosureShop' (copyrighted material) which seems to be the most integrated solution. Those people that prefer using "Matlab" by Mathworks Inc. for analysis or research can adopt the 'Edge Diffraction Toolbox for Matlab' (copyrighted material) by Peter Svensson, one of the major researchers in this field of acoustics and loudspeaker analysis. This speaker carries two 6.5'' woofer drivers and an Aluminum 1'' dome tweeter by SEAS mounted on a relatively large baffle area: 24.4 cm width x 112.4 cm height. Manufacturer's SPL response for this tweeter driver on a very large baffle is very smooth up to dome-breakup above 20kHz. According to Electroacoustics a tweeter must have a 12dB/octave roll-off rate at low frequencies. If we add the 2.5dB/octave introduced by BDS we end up with a total rate of 14.5dB/octave which can be easily confirmed by measurement markers at 250-500Hz. The 3.8kHz peak can also be observed. However the 1000 to 3000Hz range is not as accurately simulated as expected. BDS simulation programs are usually confined to first-order-diffraction computation with the four baffle-edges only acting as diffraction sources; the rest of cabinet sides and edges are neglected (higher-order-diffraction). As a consequence results lose accuracy below 1-2kHz. Such programs rarely give the -6dB drop exactly at very low frequencies. An additional source of simulation error is the driver behaviour itself. Loudspeaker driver emits off-axis radiation that "drives" diffracted sound-field. In the previous tutorial article on directivity and diaphragm rigidity we explained that most textbooks and engineers use the rule of rigid piston to model sound radiation either on or off-axis. This is conventionally used also by simulation software dedicated to BDS. The truth is that loudspeaker diaphragm's behaviour deviates from both ideas: it acts as a cone (or dome) that is not rigid (ie. it does not vibrate with uniform velocity). Even if we assume rigidity for woofers and tweeters below 2000Hz, their piston-like directivity needs correction. In that sense BDS simulation programs use incorrect pressure level radiated at 90 degrees off-axis and get wrong diffraction computation in all steps that follow this assumption. Surely a more detailed discussion could clarify all aspects of this issue at various frequency ranges but this is outside the scope of this article. -What is the impact of BDS on speaker performance and its design process ? BDS decreases bass response of woofer drivers below 400Hz by several dBs. At the same time measurement systems not operating in very large halls of more than 100 m2 fail to provide accurate SPL curves below 300-400Hz. These two effects leave the design engineer in complete darkness. If the passband level of a woofer driver in this range of frequencies is unknown then what sort of attenuation should the crossover network's amplitude response impose at frequencies above 400Hz ? At the same time BDS distorts SPL curves of loudspeaker drivers of all types. Lab measurements provide an accurate picture of final driver SPL curves above 400Hz and design process is not compromised. -What can be done about BDS during design procedure ? As theory implies BDS imposes a -6dB loss as we get close to 0Hz. Speakers having a very small baffle area exhibit this limiting value at relatively high frequencies, let us say at 200Hz. Modern music bass instruments (80-120Hz) and human voices at mid and high frequency spectrum create a catastrophic imbalance. As baffle area increases the BDS attenuation of these bass frequencies gets milder (-3 to -4 dB). If we compare speakers of equal baffle area, things get better for those with increased depth (ie. cabinet volume). However aesthetic rules are also decisive in cabinet design and should receive proper attention. Another factor that controls BDS is the degree of directivity which a loudspeaker driver presents for 90 degrees' off axis radiation, because it is the latter that eventually creates diffraction. 3/4'' tweeters radiate strongly at this angle, create stronger diffraction and end up with stronger SPL anomalies in their passband. In a similar sense large-diameter (directive) woofers present smoother SPL responses at higher frequencies. Talking about equivalent woofer configurations, there may be several reasons for using multiple 5'' instead of one 6.5'' woofer driver but it is the latter that will provide a clear mid-frequency range with moderate SPL fluctuations. Baffle placement is another factor that needs to be discussed. Placing tweeter domes very close to a baffle edge will not only adversely distort their SPL curve but degrade stereo imaging too. 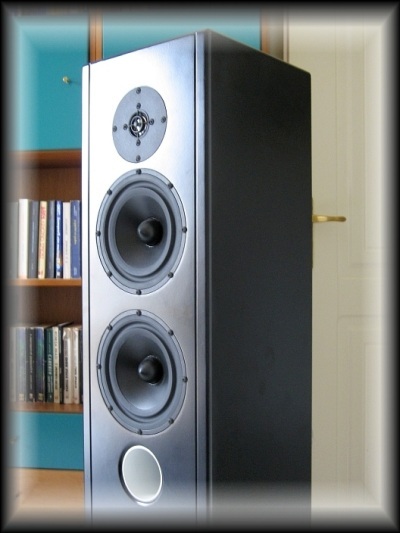 Three-way speakers with at least one large-diameter woofer driver (for instance 10'') can be very privileged. Their baffle needs to be wide enough to accommodate the woofer's diameter hence substantial baffle area surrounds the other two drivers : diffraction peaks and dips are kept to a minimum and imaging improves. Another interesting technique that diffuses SPL peaks and dips is to avoid having the center of a driver at equal distances from multiple nearby baffle edges. That is why many designers place the tweeter driver asymmetrically on a speaker's baffle. In that sense it is a bad idea to have the tweeter's center located at equal distances from all three nearby edges.